Oak Park Friends Meeting welcomes with great joy three new members who add new energy to our small meeting of eighteen members. We are grateful for the expanding circle of community we share. We continue to meet for worship at the Oak Park Art League, but we have invested time and Spirit into a threshing session to help determine our wants and needs for worship space. With the support of Field Secretary Judith Wolicki as discussion moderator and the leadership of the newly established site committee, we are examining other potential worship environments. Decisions will soon be made. Our Adult Religious Education program is vibrant and brings the voices of elder Quakers and historical Quakers to our Meeting. We have examined the words of Herbert Hoover, Parker Palmer, Alice Paul, Bayard Rustin, and John Woolman. The insights into the challenges these Quakers faced remind us of the importance of all our testimonies. In addition our Ministry and Care Committee reminds us of the importance of weaving climate change issues into our actions. We will be examining the importance of soil and discussing how our lives can speak to improving the climate. Members’ involvement in “green activism” allows us to reach beyond our meeting into the wider community. We will soon be examining the Quaker Earthcare Witness climate change statement for seasoning by our Meeting. Our children’s education program has focused on supporting the Chicago Friends School with one member being involved at the Board level. Children related to members and attenders do visit our Meeting on occasion, but no steady attenders under 18 are present. We have considered how our future sites might better welcome young families with children. Our meeting Spirit strives to support our members and attenders for life events and at times of sadness, loneliness or happiness. Cards, phone calls, and celebrations help to express our ministry of care to all who worship with us as we strengthen our collective Spirit. Meeting began with silent worship. Quaker Practice in Action: Quaker Earthcare Witness succeeded in getting PNC Bank to cut back mountaintop removal financing after years of effort. Our Meeting will send a letter to the CEO of PNC Bank with acknowledgement of these efforts to improve our environment by better stewardship of financial resources. Carolyn will bring name/address of PNC to clerk for letter. Review & Approval of March Minutes: Felicity did not stay for business meeting. She should be removed from the attendance list. Minutes approved with that correction. 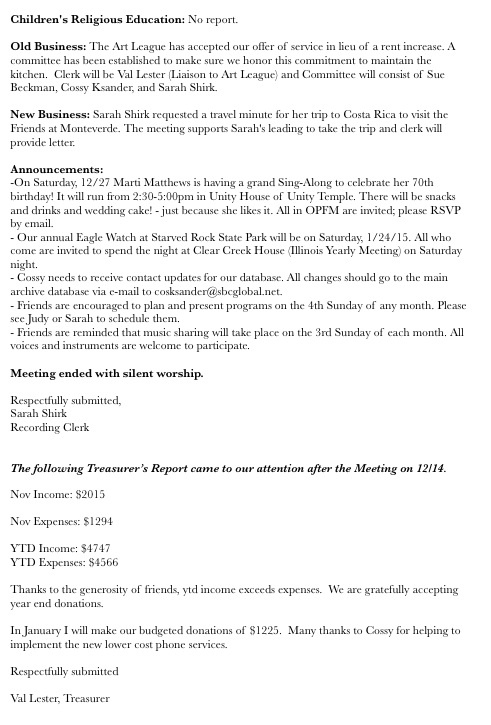 Treasurer's Report: Year-to-Date income = $8,369 and expenses = $8,164 for a net of $205. Balances of all funds total $14,749. 5/3/15 8:30am, M&C Meeting; 11:30, Worship Sharing with Queries? We opened with silent worship. Minutes: Minutes for March were approved during the week after the March meeting. * Johnny and Marie Gillespie: They are officially members now. Sarah has offered to host a party early this summer. * Cossy Ksander: She is ready to have her Clearness Committee meeting. Three people have been found to serve on it, and it will probably be scheduled soon. * Marti: We discussed her situation once again and once again came to no clarity or conclusions about dual membership or about her theological questions regarding our Meeting's practice. We will season this further. * Support during life events: We discussed some of the issues involved in supporting our members and attenders for life events and at times of sadness, loneliness or happiness. We decided to buy a selection of blank cards so that we have them on hand to send at a moment's notice if needed. Pam volunteered to buy the cards, and Adrian will look in her stash to see what to contribute. * Midweek Worship: We will season this further. * Environmental Concerns: We will ask business meeting to approve signing the QEW climate change statement. Adrian will conduct an environmental workshop May 31, about soil. The welcoming party for Antonio, Pam Timme's grandson, is scheduled for May 3rd at noon. Location is the home of Kelly & Rick at 288 Olmsted Road in Riverside. A visa gift card in the amount of $50 was approved at the business meeting. Members/attenders who are moved to contribute to the gift can send donation to OPFM with "Antonio Gift" on the memo line and give to Val Lester, Treasurer, by April 30th. The meeting with representatives from OPFM and OPAL is scheduled for 8pm on April 30th. Val & Cossy will represent OPFM with Adrian and Judy if their schedules permit. *Adrian Fisher is clerking Cossy's Committee for membership. * New member party is tentatively scheduled for July 19th at Sarah's home, 331 North Ridgeland Ave.
*Site Committee threshing session notes were shared. Ask Val, Site Committee Clerk, for details. The mission is to find the long-term home for our Meeting that best fits the guidance from the Threshing session. Committee members will be scheduling site visits, then options will be weighed by business meeting. Nominating Committee Report was distributed for edits. Updates are below. Read prelude to Chapters 1-2 of Parker Palmer's Hidden Wholeness. The discussion will take place at the library on April 14th from 7pm-8:30pm. Carpool if possible. ARE co-chairs are seeking suggestions for monthly session topics for 2015-2016. Invitation to Chicago Friends School 5th annual fundraiser was distributed. Event will take place on April 23rd at 6pm. *AT&T switched our phone service to VOIP on April 10th. New phone manager is being sought. *Sarah and Kelly will co-edit the state of the society report for ILYM. Report deadline is May 17th business meeting. *A Day in Our Village will take place on June 7th. Helen has tent, banner, & handouts from last time our Meeting participated. Kelly offers to manage the outreach program. Judy & Kelly will send an announcement to season interest in this program. * It is the season for the Trailside clean-up and maintenance. Date and time to be determined. Meeting closed with silent worship. Quaker Practice in Action: Quaker community sharing was exemplified by our Meeting studying links between our meeting and West Branch, Iowa Meeting as reflected in the Adult Religious Education topic of Herbert Hoover. *Membership letters for Johnny and Marie Gillespie were read and applications for membership were approved. *Midweek worship needs a host, a location, and a schedule. Discussion was postponed until more people can attend and provide input. *Judy will call Burke to notify him about the mid-week book discussion group. Minutes: Minutes for February were approved. Vocal Ministry: We considered this topic and possible hindrances to people speaking up, which could be shyness, feeling unfit, or not knowing what is expected. We reviewed options such as regular worship sharing, "afterthoughts," and individuals bringing to meeting and speaking thoughts of a spiritual nature that we'd thought of during the week. We decided that since fourth Sundays formerly used by our laid-down Peace and Justice Committee are open, we will schedule regular worship sharing sessions so that people might understand more about the workshop and vocal ministry process and deepen their own spiritual experience. This might lead to more vocal ministry in meeting. We also decided to suggest that the monthly queries could be read at the beginning of meeting, rather than after people have settled in. The M&C Committee decided after their meeting to season this topic further before bringing it to Meeting for Business. * Johnny and Marie Gillespie: Marie's Clearness Committee has been approved and will take place at John Muhlenburg's house on Tuesday. Val and Judy are the other people on the committee. Johny's Clearness Committee meeting will take place at Ann's house. One person who had committed to participating withdrew, and a substitute has been found, if Johnny agrees and would rather not reschedule. *Cossy Ksander: She submitted a request for membership two weeks ago. We will set up a clearness committee and Adrian will ask her if she has suggestions for Clearness Committee membership. We hope the Committee will have on M&C member, one meeting member and one attender so as to continue the practice we are developing. Pastoral Ministry and Concerns were discussed, including Midweek Worship. Ann is unable to host. We will bring the question of how and when to launch this to Business Meeting. Note: Our next meeting will begin at 8:30am on April 5, 2015. Site committee was approved and input is welcome from all members and attenders. Meetings are open to all. Appreciation is given to those who have committed to participation thus far: Valerie (clerk), Sue, Sarah, and Cynthia. On 3/29 Judy Wolicki will lead a threshing session on site envisioning at 11:30am. The committee met on March 1st to create a list of ideas about site vision. Nominating Committee: Nominating committee report will be updated and distributed. Nominating Committee report must be presented to Business Meeting on May 17. Adult Religious Education: ARE schedule approved as follows: Hidden Wholeness by Parker Palmer will be discussed on 4/14, 4/21, 4/28, and 5/5 from 7pm to 8:30pm at Oak Park Public Library. Children's Religious Education: No report. *Sarah Will draft a State of Society Report for ILYM. *VOIP phone messaging service will be place on Cossy's personal computer. Cost is $36/year. archive database via e-mail to cosksander@sbcglobal.net. *Friends are encouraged to plan and present programs on the 4th Sunday of the month. Please see Judy or Sarah to schedule them. Review & Approval of January Minutes: One change to treasurer report: Additional check for $300 was received during 2014. Treasurer has adjusted the income for 2014 to reflect this income. One change to attendance list: Helen Dickinson was present at January 11th business meeting. $6,206, expenses $6,540. Expenses were high in January since several annual donations were sent. This meeting was abbreviated owing to the snowstorm and the necessity to shovel the meetinghouse walk and help Pam get her car unstuck. Minutes: Minutes for January were approved during the week after the January meeting. Clerk's Concerns: None to discuss at this time. *Johnny and Marie Gillespie: We discussed scheduling the Clearness Committee meeting for each. The meeting should be private and at their house. We are asking selected members and attenders to be on the committees. *Midweek Worship: We discussed this possibility but no decisions were made. *Environmental Concerns: Adrian reported that QEW has a climate change statement on its website to which Monthly Meetings can become signatories. We decided that Adrian will lead a meeting for environmental concerns on May 31. Vocal Ministry: We deferred this until we feel led to take it up again. Note: Our next meeting will begin at 8:30am on March 1, 2014. Kitchen Committee: Letter to OPAL board suggested hiring Christina to help with kitchen maintenance under the direction of OPAL OR increasing the rent. The OPAL board will review the letter soon. Val will report back on their reply. It may be time for a site committee to replace the kitchen committee. Kitchen committee is laid down. Valerie has volunteered to clerk the site committee and will continue in role as OPAL liaison with OPFM. Nominating committee will fill this new committee. Mission and member suggestions should go to Val. We approved these decisions. Nominating Committee: Nominating committee will meet February 19th at 6:30pm at Sarah’s home 331 North Ridgeland Ave. Nominating committee made up of Clerk Sarah Shirk, Sue Beckman, and Valerie Lester welcomes suggestions for committee members or any positions including the new site committee. We approved this decision. Adult Religious Education: Discussion on Alice Paul was postponed due to weather. This discussion will be moved to the end of March, either 3/22 or 3/29. Herbert Hoover will be discussed on March 1st. Book discussion rooms are available at the main library, Dole, and Maze. Kelly and Cossy will pick dates for April discussions. All are encouraged to purchase book for April Book discussion. Book selection TBA. *2/21, 57th Street Meeting (5615 South Woodlawn, Chicago) is hosting a Chicago-Area Friends Gathering for worship, programming for children, and fellowship. 10:00, 2-hour Meeting for Worship while children enjoy special programming. Potluck at noon followed by optional movie Arranged. Details to be posted on our website. * Background information for the Quaker Practice in Action provided by Kelly Maynard is pasted below in italics. “I think he may get his wish,” Graham chuckled as Capitol Police led the protester away. “On Thursday, February 5th two protesters, David Barrows with CODEPINK and Helen Schietinger from Witness Against Torture, were arrested for speaking out during a Senate Armed Services Committee Hearing about Guantanamo Bay prison and the future of US detention policy. Barrows, a long-time DC area peace activist, spoke up during Senator Lindsey Graham’s speech (R-SC), calling the Senate hearing “a disgrace and full of lies.” Senator Graham was claiming “it’s common sense that if prisoners have been in prison for that long, they deserve to be there and that the protocols and review board at the Guantanamo bay facility are adequate.” Barrows is well aware that over 50 of the prisoners still in Guantanamo never should have been there and have been cleared for release for years. After the arrest of Barrows, Helen Schietinger with Witness Against Torture stood up and confronted Senator Graham for presenting false information and deliberately misleading the committee. Quaker Practice in Action: Courtney Martin created a Society for Creative Philanthropy from a book advance check, showing how small amounts of philanthropy can impact the world. The book entitled Do It Anyway, the New Generation of Activists was discussed on a radio talk show with Quaker Parker Palmer. Treasurer/Finance Committee: December income $1,346, expenses $340. Year-to-date income $5,783, expenses $5,655. Contributions totaling $750 approved by business meeting will be made in January. Clerk's Concerns: Regarding ofﬁcer selection, we discussed how to support the nominating committee as it does its work ﬁnding new ofﬁcers. As Ministry & Care members we will try to share a message about the positive spiritual advantages and joy of service to meeting. Yes, committee service involves work, but it is also a great opportunity for spiritual growth, afﬁrmation, and contribution to our community. Since we lack a Peace & Justice committee, we considered the idea that if such a committee were renewed, we would like to focus more on climate issues because these are so deeply intertwined with peace and justice. This issue is the deﬁning issue of our time, and we would like our meeting to take action. *Johnny and Marie Gillespie: Meeting members/attenders are taking them out for lunch today. We decided that the clearness committees for each should have three members: one from M&C, one attender and one meeting member. We will present this structure to them, ask if there is any particular person they would each like for their committee, and proceed with committee formation. *Marti Matthews request for dual membership: She is not in a hurry to resolve the issue and is in Indianapolis for a while. We will take this up again upon her return. *We hold in the Light several members and attenders who seem to need some extra love and attention. We offer a helping hand. Vocal Ministry: We deferred this until our next meeting and will put it ﬁrst on the agenda next time. Note: Our next meeting will begin at 8:30am on February 1, 2015. Naming Committee: Val Lester accepted nomination as 3rd member of nominating committee. Business meeting approved this nomination today. Nominating Committee: 1st proposal for nominations should target April 12th business meeting. Final approval for next ﬁscal year should occur at the May 10th business meeting. Adult Religious Education: A terriﬁc and well-attended program on John Woolman took place on January 4th. The February 1st topic will be Alice Paul. Children's Religious Education: Ann brought Felicity and Charles to a December 1st Day. Sarah will deliver OPFM donation to Chicago Friends School. Kitchen Committee: Clerk reported that we will clean & stock kitchen weekly. Self-cleaning oven turned on today. Refrigerator items will be dated and rotated. Do NOT throw away still life items. Cleaning day will be publicized. Hot water tea kettle donated. Committee meeting to be scheduled in February. Old Business: Switching of the phone service to VOIP approved. Phone # will not change. Val will confirm with Cossy who will be asked to contact Angela and make arrangements with phone company. New Business: OPFM clerk provided a travel minute to support Sarah's visit to Monteverde, Costa Rica. We send our greetings and love to Monteverde Friends with whom Sarah will visit, including the Friends school. *Our annual Eagle Watch at Starved Rock State Park will be on Saturday, 1/24/15. All who come are invited to spend the night at Clear Creek House (Illinois Yearly Meeting) on Saturday night. *PADS dinner service on 1/30/15; please see the sign-up sheet or talk to Val. *Cossy needs to receive contact updates for our database. All changes should go to the main archive database via e-mail to cosksander@sbcglobal.net. *Friends are encouraged to plan and present programs on the 4th Sunday of any month. Please see Judy or Sarah to schedule them. Meeting ended with silent worship. Quaker Practice in Action: We honor all persons who go to the polls to vote instead of taking up arms. We also honor Colorado Governor John Hickenlooper, a Quaker, who refrained from purchasing negative ads against his opponent during the recent election race. In addition he has a record of standing up for gun-control legislation. Treasurer/Finance Committee: We are investigating switching the OPFM phone number to VOIP, estimating that it will save approximately $12/month. Cossy will pick up the change process with contact info provided by Val. Audit data for FY12/13 has been forwarded to Will Ksander and FY13/14 has been forwarded to Karen Heckman. Audit results will be prepped for January business meeting. The annual income to date is $3,126 and expenses are $4119. 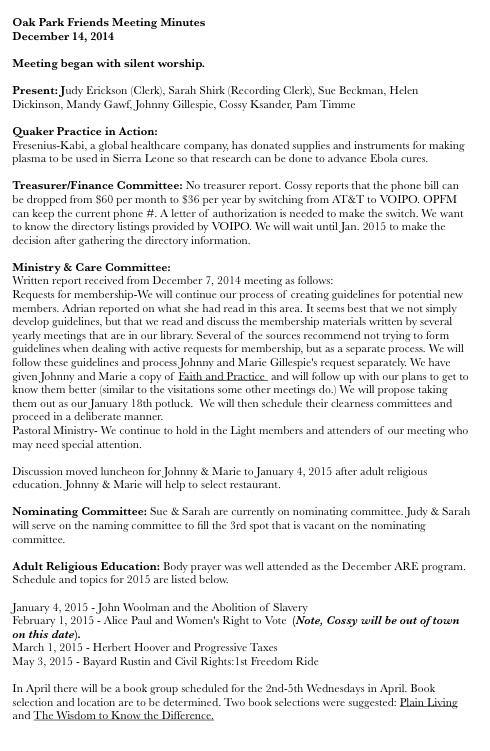 Minutes from the M&C Committee meeting on 11/2/14 were presented as follows: We opened with silence. We have received a request for membership from Johnny and Marie Gillespie. We will suggest to them that we meet informally to discuss the process of applying for membership. We are preparing a packet to read for subsequent reflection and discussion. The packet will include a copy of Faith and Practice, the ABC's of Quakerism, and article about clearness committees and a welcoming summary of what is expected of members and the rewards of membership. Adrian will draft the summary and other M&C members will edit it on Google Docs. We gave thought and extended love on pastoral concerns. We closed with silence. Val, Sarah, & Judy reviewed contents of children's cabinets on second floor. Condensed the 3 cabinets to 2 so that OPAL can rent the 3rd one for rental income. Books will be donated to Chicago Friends School and toys were donated to Goodwill. Notes from the Direction of the Meeting were provided by Judy Wolicki and reviewed. Support for the Peace and Justice committee could be garnered from ILYM committee members, peace resources, and other monthly meetings. Any member or attender of our meeting is encouraged and supported to create connection with clerks at other meetings to create cross-meeting synergy and improved communications. OPFM P&J is a working as a committee of the whole. We will need to follow our leadings as passions point. Ilene Flannagan's book ﻿The Wisdom to Know the Difference addresses this issue of where to place P&J efforts. We note that we are enriched and inspired by meeting for worship. New Business: Time for the community Holiday Food & Gift basket donations. In December 2013 we sponsored 5 participants. Sponsoring 5 in 2014 was also approved. Val will request extended stay until 2pm on 12/21 for the holiday pot-luck. Pam will create a sign-up sheet for food & supplies. Art League requests adoption of space in lieu of a rent increase. Subcommittee formed including Val, Cossy & Sue to address adoption and maintenance of kitchen space. Request has been made for community service hours to fulfill by January. Contact Clerk with ideas. Eagle watch will take place in January 2015. We closed with silent worship. Quaker Practice in Action: The Nobel Peace Prize 2014 was awarded jointly to Kailash Satyarthi from India and Malala Yousafzai from Pakistan "for their struggle against the suppression of children and young people and for the right of all children to education." Treasurer/Finance Committee: Estimate for web hosting is $44 per year. We approved paying this expense. Kelly will contact Denise about the future web hosting costs. Ministry and Care Committee: M&C will offer a Clearness Committee to Marti Matthews in response to her letter concerning dual membership. Marti will be asked to suggest members based on her spiritual needs. Members can include ILYM Friends. Judy will make contact as a representative of M&C. Oral reading of queries is a well-established practice that still has value for many in our community. We will continue monthly readings aloud. Helen will pull them from Philadelphia Faith & Practice and occasionally invite others to read them. On the 3rd First Day a copy will be set out for possible discussion during lunch. In attendance: Cossy Ksander (co-clerk) and Kelly Maynard (co-clerk). We reviewed the responses from the September 7th ARE session, and began brainstorming people/topics related to them. We came up with a general theme for the Spring semester, The Equality Testimony and Quakers who led movements in America that resulted in changes to the legal system and have shaped modern morality. From a list of eight people/movements we selected four to present this spring. We decided to postpone having a Weds evening book study this Fall. We will have one during the last four Wednesday evenings of April 2015. Kelly and Cossy will read, or at least skim, some books and select one in the New Year and start announcing it. We have a few suggestion from various Friends but more titles for consideration are always welcome, send email to Kelly or Cossy. Also need someone to offer their home. Fallback is that Kelly can do it, but that means everyone else has to travel to the South end of Riverside. Day. Kelly will go through the material and prepare a one-page handout and we will discuss this on October 5th, 2014. The First Sunday in November we are willing to give to the Direction of the Meeting event if wanted. Otherwise we’ll find a short reading by Thomas Kelly to go over. In regard to our idea of having a December workshop like we did on Grief in 2012 or Membership in 2013, we have not discerned a topic of widespread interest/need for the meeting. If we do discern in the next two months it might be too late to get the news out so we will not do a long workshop this year (but if we do discern a need we can plan to do it in Fall 2015). Instead Cossy will do a regular length session discussing body prayer. Friends are asked to fill in Sarah’s Doodle Scheduler shortly on dates they can come to the Direction of the Meeting event. There will probably be no Sunday morning OPAL classes upstairs until 2015. Kelly and Pam will meet to consider archiving OPFM materials that Pam has gathered. Meeting began @ 11:30am with silent worship. We acknowledge with gratitude the medical support staff helping with the Ebola outbreak in Africa. Review of June Minutes. No changes. Treasurer presented 2014-2015 budget. Discussion took place concerning lowering the phone bill, laying down the Chicago Fair Trade dues, and adding support for Chicago Friends School in the amount of $100. Revisions were made to the draft budget as discussed. Ministry & Care: No report. Children: Chicago Friends School will open with two classrooms and approximately 15 students. New Business: We approved sending the OPFM directory to ILYM. Judy will send names and addresses of regular attenders and members. 9/19-9/21, Annual Evanston Silent Retreat; area F/friends are invited. Adrian Fisher recognized for her work as Sustainability Coordinator at Triton College. Add to Religious Education: Evening program was well attended. ARE volunteered to organize a fall program. Consensus expressed that breaks between sessions are beneficial. Peace & Justice Committee report attached. On Saturday, May 31st Kelly Maynard organized a Trailside Project clean-up. Nominating Committee report will be provided in full by Bob Southworth. Preliminary 2013/2014 year end income $9,818 and expense $9,632 resulting in a net +$188. Adult Religious Education sponsored a discussion led by Adrian Fisher on Earthcare & Spirituality in June. No summer sessions are planned. Kelly submitted a response to a Forbes article title, "Is Vladimir Putin another Adolf Hitler?" After editorial changes, the response was approved to be submitted from OPFM to Wednesday Journal, Oak Leaves, Chicago Tribune and Forbes. Unanswerable would be the long-term consequences of such actions, and unanswered is the truth of who would benefit from such actions. If the US sends troops to the Ukraine, how long will our military need to be there? Defense contractors make money during wars; troops die. As evidence mount for the long term environmental consequences of fracking (climate change; air, water, and ground pollution; earthquakes) we need to answer who will make money from fracking while our planet slowly sickens and dies. Quaker religious testimony teaches us to oppose all wars, and live as stewards of the earth. We support the strong efforts at diplomatic solutions to the crisis in the Ukraine proposed by President Obama, and object to calls for starting a new military engagement in the region. We object to claims that fracking is a sound way to provide cheap energy. We support diverting monetary resources from our bloated military budget to investment in sustainable energy sources which can help create jobs in the US, as well as turn us away from further environmental destruction." Mark, Rick, & Kelly weeded and mulched the garden. They found native plants that survived. The naturalist will contact Kelly for another work day when needed. Thanks to all who helped revive this project. No business meeting in July, next meeting will be August 10. June 29th will be celebration of Kelly & Rick's anniversary and Sarah's membership. It will take place at 288 Olmsted Road, Riverside. Meeting ended with silent worship at 12:25.